At first glance, people often dismiss this aspect as being about religion and they shut down … that’s too contentious of a discussion. Or others shy away from the conversation quickly, anticipating a talk on New Age, spirit-realm, mysticism. None of these things are wrong, but this aspect is not entirely about these topics. This 6th and final component of the Artist’s Wheel is actually something that most everyone can find a powerful connection to, whether they are religious or not, if they give it a chance. Within the Artist’s Wheel, Spirit is indeed an extension of the Heart Aspect, (which encourages us to share love and community beyond our own self and ego). But Spirit goes one step further, offering us an opportunity to wrestle with and inquire about life’s most pressing questions: Why are we here? How are we supposed to live? Why do things happen the way they do? Are we really all connected? 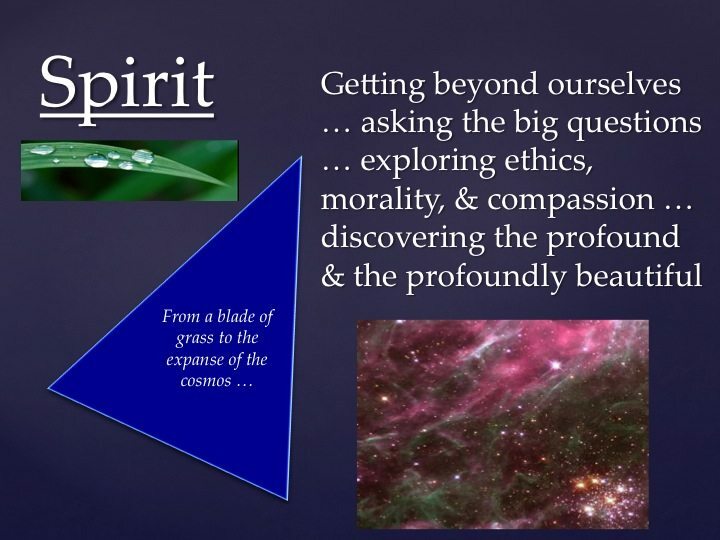 Exploration of Spirit allows us to tap into the sacred of our world, and discover the sacred in all things. The Spirit aspect allows us to see the profound, the bigger picture, the depths of humanity and the cosmos … the subtle beauty in a blade of grass in the wind. Aren’t these the sources for all great art and the inspirations for our finest transformational leaders? With much greater clarity, I believe David Steindl-Rast, a Benedictine Monk, demonstrates the power of Spirit in his TED Talk when he explores gratitude as a primary source of happiness. While he is not talking directly about spiritual pursuits, I believe his life as a spiritual man has opened the door for him to discover such incredible insights. Gratefulness is of our Heart and Spirit.